Yeah, so, iPad Pro. For those who know me, feel free to gasp. Now that we have that out of the way, here’s my first impression of it. 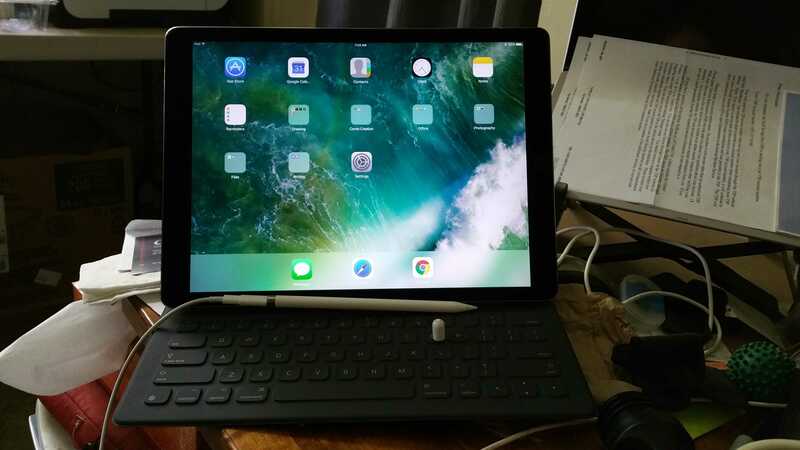 I bought the 265Gb WiFi version of the 12.9 inch iPad Pro with the Smart Keyboard and Pencil as a compromise drawing slate solution. I’ve used Wacom drawing slates in the past and find I have a hard time drawing on one surface while looking at another, and I can’t afford Wacom’s Windows 10 drawing tablets just yet. Further, whether Windows users like it or not, Windows is not yet a superior platform for freehand drawing without compromises and significant investments in software and learning time. Hence the iPad Pro. For the money, it has the best mix of capability, software, and frankly, ease of use of any platform out there. If I was going to spend this kind of money, I wanted a platform that worked out of the box with minimal fuss. So far, the iPad Pro delivers on those counts. The device is solid and, to my surprise, heavier than I expected. That’s likely mostly the result of the battery, which gives me hope that it will last a while, even using the Bluetooth to use the Pencil. The screen is fabulous. Hands down, it’s the best resolution I’ve ever seen on a mobile device, so proper credit to Apple for that. The WiFi and Bluetooth worked as expected and with none of the onetime fuss over connecting to networks Apple had back when I was using their products regularly, so that is definitely a plus. As a regular Android and Windows user, I found the idiosyncrasies of iOS to be just odd. I’ve used many Apple products in the past, so I know they can get a little narrow minded about their design philosophy, but things like limiting which screen widgets can appear on seem plain silly to me. Granted, I haven’t used it enough to identify if some of the other complaints about the operating system are warranted for me, but those kinds of limitations will guarantee this will be a specific purpose device for me. App-wise, I love the diversity but hate the App Store. The store design seems to be intended to make things impossible to find unless you already know exactly what you are looking for. And, while yes I am spoiled because of the Play Store, the cost of actually useful apps is a little breathtaking. My primary use for this tablet will be, for the time being, drawing and photo editing, neither of which I have done much of yet, but what I have played around with so far has been nice. I will report back on that later. Overall, I am pleased with the iPad Pro. It does exactly what I expected it to do, if not exactly how I wish it would do it. As a first impression, Apple has made a good one.